The common date palm, Phoenix dactylifera, is cultivated extensively throughout the world's hot dry regions. The date palm's male and female flowers grow on separate trees and must be pollinated by hand. One male tree is sufficient to pollinate up to 50 female trees. Arrack or Arak is strong alcoholic beverage made in the Middle East and Asia from dates or from the sap of the date palm tree. It is frequently flavored with aniseed. Date stones have been found in Egypt that date to 4500 BC. 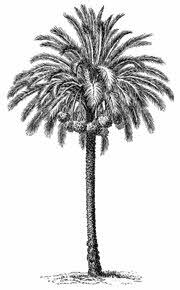 There are 60 references to date palms in the Old Testament. Dates contain up to 70% sugar by weight. The average date has about 24 calories and contains no fat or sodium. California grows 99.5% of all dates grown in the United States, and Arizona produces the rest. The Coachella Valley in California is known as the Date Capital of the world. The average date palm produces about 100 pounds of dates a year. A good date palm can produce 300 to 600 pounds of dates per year, and will produce for 100 years or more.